In this Special Feature, Dale Pollak, founder of vAuto, shares four operational imperatives to help dealers do a better job sourcing auction cars: 1. Know exactly what to buy. 2. Know where to buy. 3. Buy at the right price 4. Do it all faster. Special Feature by Dale Pollak, founder of vAuto. 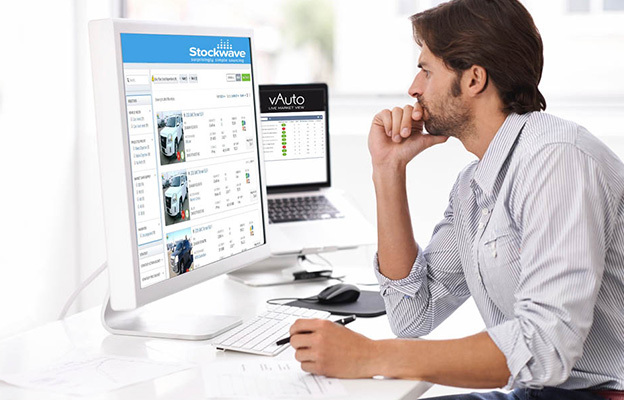 Learn more about the newest innovation from vAuto, Stockwave – surprising simple sourcing! You could say auction cars offer a blessing and a curse for dealers. The blessing is that auction cars are always available—offering a way for dealers to acquire inventory they need that they can’t get through trade-ins. For most dealers, auction cars make up 30 percent or more of their used vehicle inventory. But auction cars also carry a curse. In general, auction cars cost more to acquire than trade-ins. Their profit potential is leaner from Day 1. In addition, auction cars often have a higher market days supply metric than trade-ins, given the frequency of off-fleet/program cars in the lanes. With less inherent market appeal and profit potential, auction cars are, by their nature, more challenging as retail units for dealers than trade-ins. This reality explains why auction-purchased vehicles are often chief contributors to inventory aging problems. But I’ve come to understand that auction cars themselves aren’t the problem. The problem is the way many dealers acquire auction cars. Simply put, they aren’t as efficient, precise and sophisticated as they should be to pinpoint the vehicles they need and bring them home on the money, time and time again. 1: Know exactly what to buy. Many dealers and their buyers believe they know the exact cars that will best advance their used vehicle objectives. Some take pride in being “in the know,” and not doing any homework before they arrive at an auction. Yet, the cars they purchase end up being aged units, month after month. What gives? The problem is the variety and number of available auction cars, and today’s ever-changing retail market. It’s impossible, without the help of technology and tools, to know how a specific vehicle’s color, equipment, mileage, ownership history and trim level will play against competing cars. Dealers who reinvent their acquisition strategies use this car-specific precision to build auction shopping lists that include alternative choices if they can’t get the cars they want the most. 2: Know where to buy. With increased competition to acquire auction cars, many dealers recognize they need to expand their sourcing efforts beyond the local auction. The challenge then becomes how to easily and efficiently determine the auctions where the cars that best fit your retailing objectives are available. The most proficient dealers and buyers rely on technology to tell them where the cars they want reside. They also use technology to facilitate the transfer of the purchased units back to the dealership. The end result: They are more efficient and productive buyers every time they go to an auction to supplement their inventories. 3: Buy at the right price. Dealers who reinvent their auction sourcing efforts eliminate the guesswork that once guided their bidding on auction cars. Today, they know the maximum they can afford to pay on every vehicle. How? They use technology and tools to calculate each unit’s profit potential (accounting for the costs of acquisition, transportation, reconditioning, a pack, etc.) before they make a first bid. Of course, it takes discipline to stick to these parameters in the lanes, particularly if you’re frustrated by losing cars you really wanted. But the bidding precision, and accompanying discipline, are critical to ensure you make your margin when you acquire an auction car. 4: Do it all faster. With technology, dealers and used vehicle managers can prepare for auctions in minutes, not hours. They eliminate trips to auctions where the cars they need weren’t there in the first place. They waste no time bidding on the wrong cars. In an effort to gain even more efficiency and speed as they acquire auction cars, some dealers now rely solely on online sources, a time-saving shift that improves showroom efficiency; managers are in the dealership, working deals and managing their teams. The good news for all dealers is that the effort needed to achieve these operational imperatives won’t be as daunting as it may seem. In fact, I’m excited to have worked on a technology solution called Stockwave that, almost with the flip of a switch, will help dealers gain a higher level of auction sourcing efficiency and proficiency than previously possible. Stockwave is a first-of-its-kind sourcing solution built to tackle the most complex challenges in wholesale buying and sources inventory from auction houses in every corner of the country — Manheim, ADESA, SmartAuction and more — with no preferential treatment given to any auction. What you get is the best recommendations out there, period. As I look ahead, the used vehicle market won’t get any easier, and auction cars will continue to play a critical role in helping dealers meet their sales and profit objectives. It stands to reason that dealers who reinvent the way they source auction vehicles will gain advantage over those who prefer the inefficiencies of the status quo.